DIY Minnie Mouse Tutu, No Sewing Required! I am a total sucker for tutus. I totally think every girl, no matter the age, should wear them. They are big and poofy and full of fun. Plus they are too cute! You can get them in every color, style and length. I make them often because they are so cheap. You can make a toddler tutu for around $5! Adult for $10. 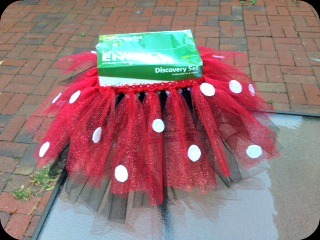 I made this Minnie Mouse Tutu for my youngest daughter for her birthday. She pretty much lives in it. Cut strips of tulle about 3 inches wide by about 28 inches. This is not a rule. You can make them a little less wide, a little shorter, a little longer. You get the idea. This is just a general guideline. Take a strip of tulle and fold it in half. Lay the loop, where you just folded it, over the piece of elastic, or in the hole of the headband. Fold the ends under the elastic and pull through the open loop and pull through. And then pull it tight! Keep doing this all the way around, until full. If you are doing a pattern keep that in mind when adding to the tutu. I did a bottom layer of black and a top layer of red. 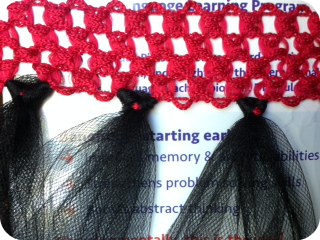 If you are using elastic slide all of the knots together, making more room for more tulle to make it fuller looking. I didn’t make this tutu as full as I normally would, only because she wears it out of the house a lot and it’s hard to sit in a carseat with a big ole’ tutu. Find something circular to trace onto the backside of the white felt. I used the cap from the glue bottle and made them about an inch across. It took 20 dots or so and glue them on with tacky glue. Makeup Bag DIY – No Sewing Required! My granddaughter made these for the two little girls who were in her wedding. When I heard her tell one of the moms over the phone not to worry because she had already made the dresses, I was a bit skeptical!! She used the brown crocheted headband with off white tulle. They were adorable!! The girls will probably be playing in them for a long time!! Who says you have to pay big bucks for costumes and wedding apparel! !